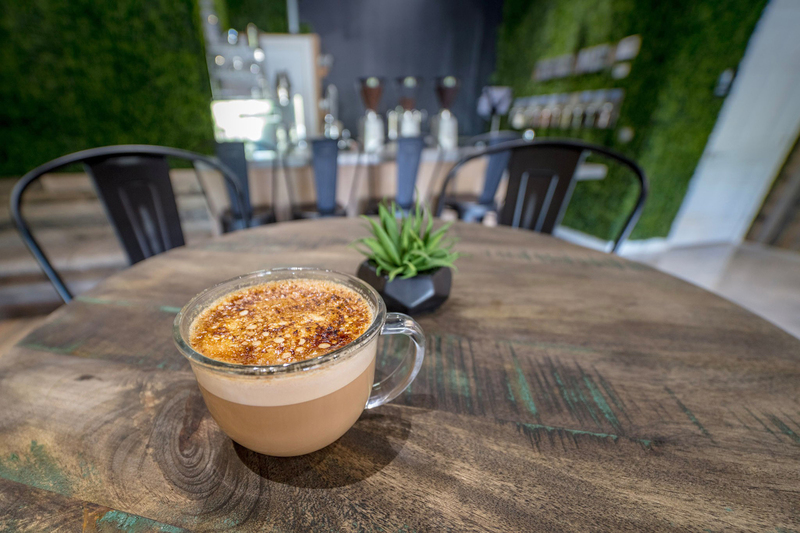 Inside a bustling Pinecrest shopping center at the corner of Chapman Field Drive and Southwest 82nd Avenue, brothers Cassidy and Jordan Athos—owners of Brewing Buddha coffee shop—experiment with flavors like pistachio, lavender and smoky s’mores. From the outside, one would never guess that the inconspicuous storefront brews some of Miami’s most interesting coffee. At Brewing Buddha, the brothers churn out sweet plantain lattes, coconut cupcake cappuccinos and even black coconut coffee infused with activated charcoal. Without cooking or restaurant experience, they taught themselves how to develop flavors and run a full-service coffee shop. Before the brothers plunged into Brewing Buddha, Cassidy, a self-taught photographer, spent years selling prints and furnishing hotels with his artwork. Though Cassidy sold hundreds of photographs, Jordan, who owns Miami Mint, a gold and coin shop in the same shopping center as Brewing Buddha, suggested Cassidy open his own place to showcase his work. For months, Cassidy and Jordan learned the science behind coffee-making. During the shop’s 1½-year buildout, the brothers set up a makeshift kitchen inside Cassidy’s home, spending three to four hours a day on recipe development. Inside the shop, which features wood paneling, grass walls and rustic furnishings, you’ll find a number of Cassidy’s prints hanging on the walls. The menu, designed by the brothers, focuses mostly on coffee with a few small bites. Every coffee-based drink uses beans from Relentless Roasters, a Miami-based roaster. Lattes include Cassidy’s own honey turmeric, as well as white chocolate raspberry, campfire s’mores with fire-roasted marshmallows, and sea salt and caramel. Cappuccinos range from coconut to chocolate with whipped cream and Oreo cookies. Cold-brew flavors include lemonade, coconut and sweet cream. There’s also fresh-brewed teas, such as lavender Earl Grey, lemongrass mint, matcha green and vanilla chai. Though the food menu is small, items are hearty. The banana strawberry and Nutella toast comes garnished with honey and cinnamon, while the Greek pasta salad is tossed with cucumbers, black olives, peppers and feta cheese.